“There is a unique kind of magic that comes from hearing a story told. 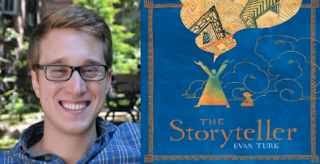 With only the power of a voice, an entire world can be created,” writes Evan Turk in the author’s note to the new book he wrote and illustrated, The Storyteller. The Storyteller is one of this year’s Children’s Africana Book Award (CABA) winners. The awards honor books that contribute to an accurate, balanced picture of Africa. The Storyteller takes place during a drought in the ancient Kingdom of Morocco. Only the power of storytelling is capable of filling everyone’s brass cup with water to share. Encourage children to write their own story – and then share the stories out loud or with pictures. Talk about what makes a story so exciting that readers or listeners never get bored and keep wanting more. · Are there stories or legends you hear at home about the countries or places where your parents or grandparents were born? · Can you imagine a story to explain a natural phenomenon – like why fireflies sparkle at night, what the man (or lady) in the moon might be thinking or why pandas love to eat bamboo? · Write about a day in your life when something magic happens to you – like the boy in the story whose brass cup is suddenly overflowing with water. Each of the 2017 CABA books could generate writing prompts – beginning with finding out more about the African country featured in each title. 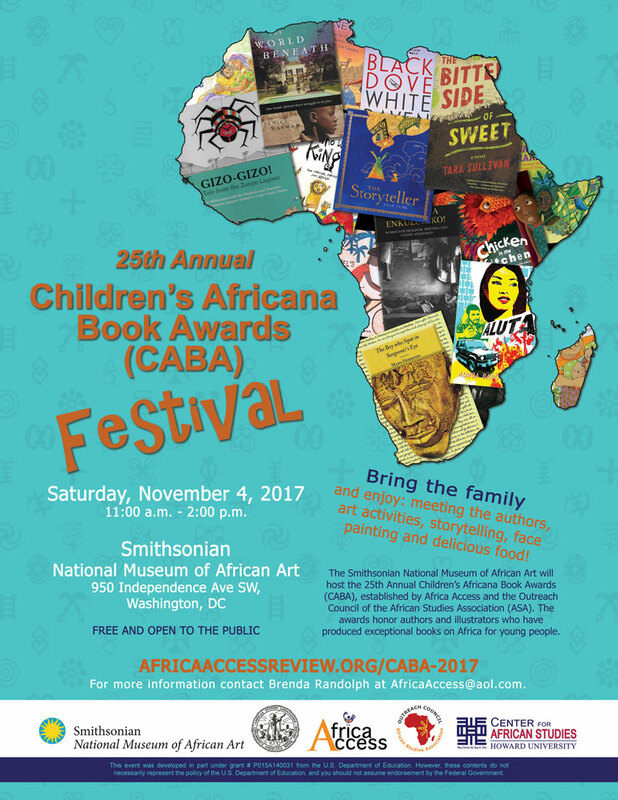 This is the 25th anniversary of the CABA awards - 90 books set in 24 countries have been recognized since the awards began. The authors of all seven 2017 winners will receive their awards at a celebration dinner November 3, 2017, in Washington, D.C. Ten previous winners are also attending the dinner, including Kathleen Wilson winner of the first CABA, five-time CABA winner E.B. Lewis and two-time winners Liz Zunon, Baba Wague Diakité and Ifeoma Onyefulu. Ntshadi Mofokeng, representing the NGO Equal Education will be coming from South Africa, author Manu Herbstein will be traveling to the celebration from Ghana, Adwoa Badoe from Canada and Janice Warman from the U.K. Click here for tickets and more information. 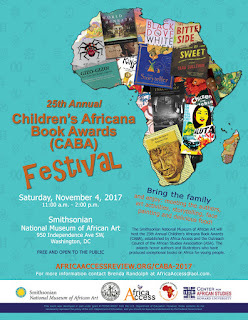 On Saturday, a free CABA family festival will be held at the Smithsonian National Museum of African Art. Children can learn to spin a yarn and weave a story, based on tales from Ghana, Morocco and Ivory Coast. A panel of CABA authors/illustrators is featured and both current and past CABA winners will be signing their books. The event is free and open to the public. More information here.